Are you a fan of the Princess Diaries? I think I saw the first movie before collecting the books, but I don’t quite remember now. While I was happy with the way the 10th book left Mia and her friends (MUCH happier than I was with the second movie! 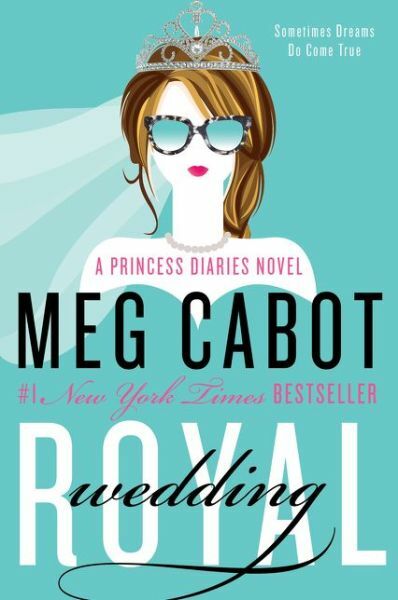 ), I had always hoped the Meg Cabot would go back to these characters. And now, we get to hang out with grown-up Mia in Royal Wedding. THE PLOT: While now 26-year-old Princess Mia of Genovia feels self-actualized most of the time, a recent scandal with her father has her in panic mode. Her doctor suggests journaling to help her handle the stress (heh heh). It doesn’t help that tabloid reporters stalk her, wondering in the media why boyfriend Michael hasn’t proposed yet. Mia has no qualms about Michael, but she wishes the tabloids, and her grandmother, would stay out of it. When Michael does pop the question, Grandmère thinks she’s going to take over the wedding and make it an appropriate royal affair. In the meantime, Mia makes another discovery…she has a young half-sister. In typical Mia fashion, she’s much more concerned with bonding with the girl and bringing her into the family than considering any scandal the press will cause. It’s also her priority to protect the girl, Olivia, from the culture shock Mia herself experienced upon finding out her royal status. MY TWO CENTS: The author does a great job of showing that while Mia has matured, she’s still very recognizable as the neurotic teenager we know and love. We get to visit with the whole gang; in addition to dating Michael, Mia is still best friends with his sister, Lily, and her other close high school friend, Tina, who has maybe broken up with rock star Boris, or maybe not. Mia also employs a few former schoolmates in the community center she founded and even has a social media “friendship” with her ex-rival, Lana. The incorporation of all the former high school comrades feels natural and not at all forced. We DO get to witness the proposal, but one disappointment; there’s not much description of the actual wedding. At that point, the action becomes so frantic that the reader is left with a recap of the wedding instead of an actual viewing. I would have much preferred to be “present” in real-time than finding out bits and pieces later. I felt that was a bit of a letdown; after all, the book is called Royal Wedding. But it’s a minor point in comparison to all the fun that’s going on. Incidentally, biracial Olivia is getting her own spinoff series, starting with From the Notebooks of a Middle School Princess, releasing May 19 from Macmillan. A princess for a new generation! BOTTOM LINE: A fitting continuation of the “Princess Diaries” series. If you grew up with the books, you won’t want to miss this satisfying installment. ON SALE DATE: Available June 2, 2015, in paperback and eformats.